Apologies if that’s not the most exciting recipe title to hook you, and the pictures don’t look much more promising themselves. However, it was becoming obvious that the only thing that would get me out of my blogging slump was making no excuses. So instead of letting the dreary photographs (hey, it’s an improvement on the last three months of no photographs!) and lackluster lead stop me, I’m going to say this: make this dish because it will be the best thing you have eaten in a while. And that’s no overstatement. Honestly, this came about because I promised a couple of people on Facebook this morning that I would post whatever we ate for lunch today. Immediately after making said promise, I panicked and realized I had no idea what that was going to be, and promises are fine and dandy but who wants a post about leftover soup, right? Thankfully, two poblanos were ready to save the day, along with a can of little red beans in the pantry. Thirty minutes later, I had two simmering pots and a kitchen that smelled like the Mexican gods had come to visit. Add some sliced avocado, minced onion, a nice large dollop of sour cream (or yea, yea, Greek yogurt instead if you’re like us) and a sprinkling of cotija – and this is as close as it gets to a mid-day fiesta in this household. This has the added advantage of being my very favorite kind of thing to eat lately – an assemblage of things in a bowl that all come together to taste way better than they should. And with that, let the blogging business re-commence! Make green grains: In a blender or food processor, combine poblanos, cilantro, onion and garlic with a splash of cooking broth or water and puree until smooth. In a medium saucepan, combine barley, remaining cooking water or broth, 3/4 of green puree and salt to taste over high heat and bring to a boil. Reduce to a very low simmer and cover, cooking for 20-25 minutes, or until grains are chewy-tender. Add remaining green puree and cook for 5 minutes more. 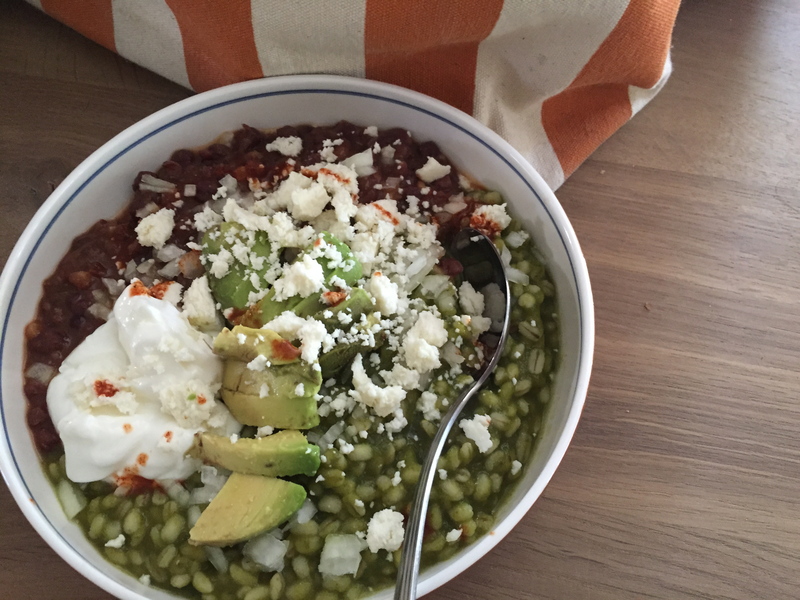 Assemble and eat: For each bowl, assemble your desired amount of grains and beans. Top with whatever things strike your Tex-Mex fancy. 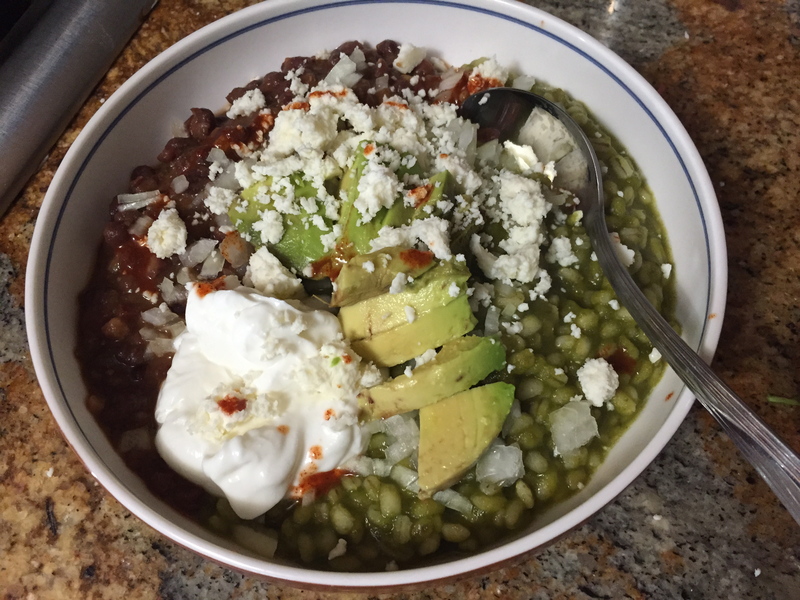 We went with sliced avocado, chopped onion, lots of greek yogurt (really balances the flavors well), crumbled cotija cheese and a little hot sauce. But I don’t see a bad move here.